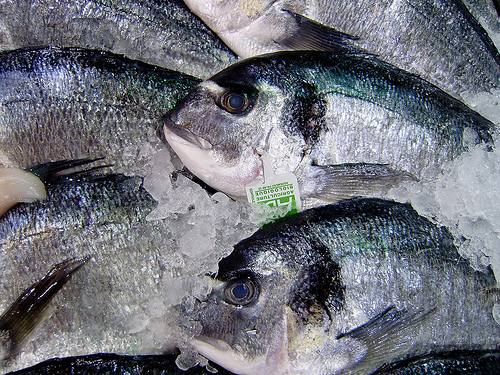 The Global Aquaculture Performance Index (GAPI) measures the environmental costs and benefits of farmed fish. Using GAPI can help inform seafood purchases on a personal level as well as policy decisions on a national level. Consider it another tool in the arsenal against overfishing the oceans, such as the Monterey Bay Aquarium‘s guide, eating lower on the food chain, or using a restaurant rater. To create the GAPI, the Seafood Ecology Research Group at the University of Victoria in British Columbia used ten indicators to judge the environmental performances of twenty-two countries’ fish farms. The ten indicators include: capture-based aquaculture, ecological energy, industrial energy, sustainability of feed, antibiotics use, antifoulants, biochemical oxygen demand, parasiticides, fish escapes into the wild, and pathogens. Each indicator is scored on a scale of 0-100 according to data gathered in 2007 from the FAO, the countries themselves, seafood industry trade press and figures, scientific literature, and any other source deemed reliable. The sources are all listed on the web site. Scores can be examined by country, by fish species, or by country-species combination. The normalized score indicates how close to the ideal (a score of 100) the aquaculture of that country or fish is. The cumulative score adds the effect of the scale of the fish farming. So, for example, you can get a general idea of how fish farming in Norway affects the environment. The normalized score is 72 – not bad since the average of all countries is 59, but could be improved. But Norway is such a big player in aquaculture (about 750,000 megatons of fish) that their cumulative score is 34. Compare that to France, with their similar normalized score of 68, but cumulative score of 96, due to their much smaller production of about 50,000 megatons of fish. My one big disappointment with GAPI is that the United States was not included. I can’t vote in any other country. Nevertheless, I can choose where my dollars go if I buy imported fish. There are plans to make the data accessible by individual fish farm – so instead of noting Canada’s score in aquaculture (which could cover many, many farms), you could choose fish by the farm in Canada that raised them. Perhaps more countries will also be included later. Image by quinet, used with a Creative Commons license. Nonsence! The index is pure truthy politics, without sound science.